I can’t believe it’s October! And 86 F at 9pm! I miss pumpkins and leaves… back to reality though. The smoke is back. It started up again last night with an awful smell. So from Sept.- November the sugar cane farmers apparently burn their fields (I assume after harvest). And Montero is surrounded by corn, soybeans (feels like home) and sugar cane fields. Which means that when they burn the fields, we live in smoke. You know that feeling when you’re standing by a camp fire and the smoke blows in your eyes and it stings a little. That’s how I’ve been feeling all day today and there’s no way to get away from it. There is no “inside” because, like I mentioned, it’s 86 and there’s no air conditioning so everything is open air. 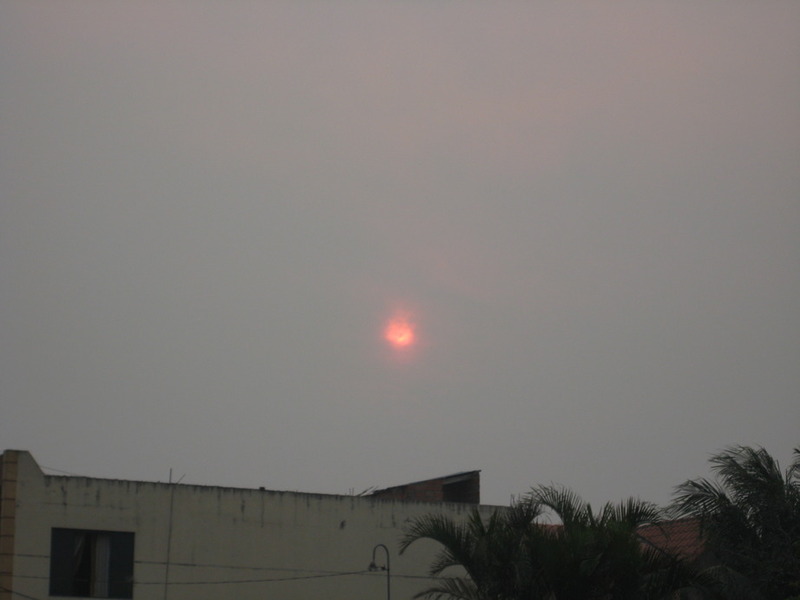 We actually saw blue sky for the first time on Saturday but most days the haze blocks out the sky and makes for a reddish sun. There have been people on the news saying “Today is a red air quality day, etc.” and apparently a few days in September they had to shut down the airport because visibility was so low. However, besides that, life doesn’t change because of the smoke. Kids are still running around outside breathing it in and everybody just goes about their daily business. I only assume that people with severe respiratory conditions must do something differently. Either there aren’t as many kids with asthma here or it’s not diagnosed because I haven’t seen a single kid with an inhaler (and I’ve seen hundreds of kids). I don’t say any of this to alarm you, we’re both still in fine health but it’s just shocking to me that they have to endure this every year. The fact that the cars have no emissions standards doesn’t help the air quality even when there’s not smoke either. For those of you wondering about our visas, we did get all of our paperwork turned in on Monday, hurray! BUT we have to go back in a week to see if it’s all acceptable. And then we have to go back in a month to see if they ACTUALLY accepted it. Our co-volunteer Andrea came with us because hers was supposed to be ready to pick up (she had already been back for the one week check). She sat in line for 3.5 hours only to told that there was some sheet she hadn’t signed so she had to sign it and come back in 3 days. : / You just never know what to expect. It’s mostly a bummer because it’s such a time drain. You basically lose a whole day doing it with the 2 hours of travel time and all the wait time.